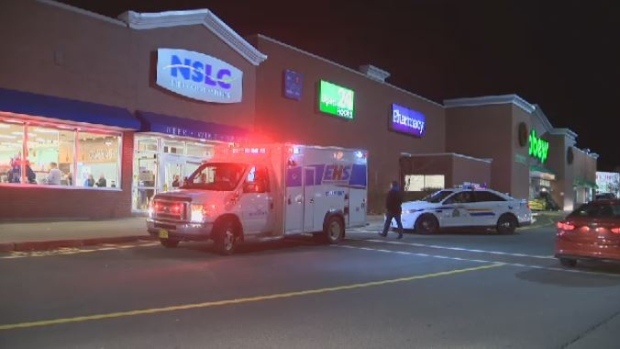 Police and emergency crews respond to an NSLC store in Lower Sackville on Nov. 8, 2018. Two teens are facing robbery and assault charges after an incident at an NSLC store in Lower Sackville, N.S. Thursday evening. The RCMP responded to a report of a robbery in progress at the store at the Downsview Mall around 6 p.m.
Police say a masked teen had entered the store and tried to steal some liquor. They say he then got into an altercation with a store employee and a customer. The teen allegedly mentioned that he had a firearm, but police say he had no firearm in his possession. The employee and customer managed to detain the 16-year-old suspect until police arrived on scene. Officers arrested the teen at the scene. Two other youths were arrested outside the store. The suspect and customer sustained minor injuries, but didn’t need to go to the hospital. The NSLC store was closed for the rest of the evening. The 16-year-old Lower Sackville boy is facing charges of robbery, wearing a mask while committing an indictable offence, and assault with a weapon. A 13-year-old from Lower Sackville is facing charges of robbery, assault with a weapon, and uttering threats. Both teens are due to appear Friday in Halifax youth court. The third youth was released without charges.